The sunny Batumi personifies all the charm of a southern city and a sea resort. It is located on the Black Sea coast and is exquisitely framed by exotic subtropical flora. Palm trees, cypresses, magnolias, oleanders, bamboo trees, laurels, lemon and orange trees, thuyas and box trees spread their sweet fragrance literally everywhere. Batumi is located in a convenient natural Black Sea bay and is an important seaport for entire Georgia. The romantic picture of ships departure from the harbor is better seen from Batumi Quay. Batumi citizens name this place Seaside Park-Boulevard. It surrounds the city along its sea border for 2 km and is at all times very crowded. This is the most popular place for both locals and visitors of the capital. There stands the city symbol – the Dolphin with a palm branch. Dolphins frolicking in Batumi harbor all year round, have become the integral a part the resort image. The city beach is next to the Boulevard. 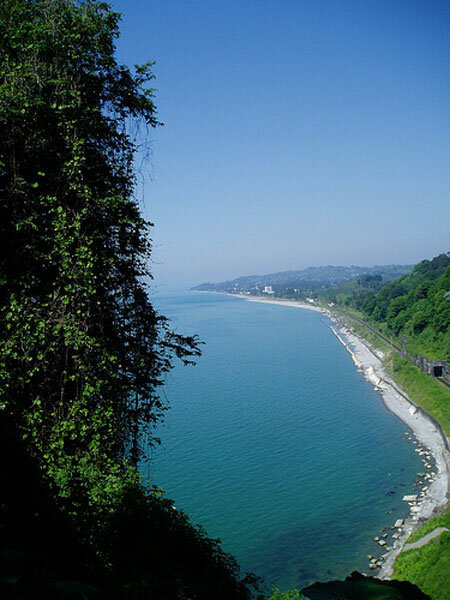 The beaches in Batumi and its vicinities are stony without sand. To the east from the beach there are theatres, cinemas, restaurants and other entertainments. The residential quarters of Batumi are seen from afar due to their rainbow coloring. The matter is that each house there is painted with certain color. The Old part of the city is especially interesting. It is 150 years old. There reins the spirit of past centuries – rows of small shops of handicraftsmen making copper ware, magnificent aroma of freshly brewed coffee in small cafes. The old city is known for the variety architectural subtleties: buildings are decorated with chimeras, mermaids, atlantes and other mythical creatures. The architecture of Batumi features the combination of European and Asian styles, the variety of architectural forms. It is possible to see buildings with elements of Georgian, Turkish, Imperial Russian, Soviet, English, French and colonial architectures; the buildings combining European and Oriental architecture. The lights of the evening city are especially beautiful. Modest in the afternoon the buildings turn into palaces by night. Contemporary Batumi is changing. New buildings of banks, hotels, tourist and sports complexes are under construction; the residential houses being erected conform to world standards. The luxurious trading centre with pools, yacht-club and entertainment for children is being built. In the long term the entire historical part of the city will turn to the area of boutiques, bars, tea and coffee houses. However, Batumi will remain the city where European and Asian cultures meet. Such cultural mix is justified by historic facts. Let us make small excursion into the city’s past. “> …the first mentioning of Batumi belongs to a Greek philosopher Aristotle and can be related to the 4 th century BC. He described the city calling it Batus (from Greek “deep”), located on the Black Sea coast in Colchis. The ancient fortress of Tamaris-tsihe served as the basis for the city. In the 2 nd century AD Romans come to Batumi. In the 5 th century Georgian tsar Vakhtang Gorgasali annexed the city to his domain. In the 6 th , the 7 th and the 8 th centuries Batumi and its area was governed by Egriss and Abkhazian princes. In the 17 th century Batumi was captured by Turkey. After Turky’s defeat in Russian-Turkish war of 1878 the city was taken by Russians. In the same year the Berlin Congress declared Batumi a large commercial port which was used by Russia for oil trading. This status lasted for 8 years and brought the country certain benefits. It did not take long for Batumi to become the third largest city in Transcaucasia and the third most significant port in the Russian Empire. By the end of the 20 th century Batumi became a major industrial center and later a famous resort. The Seaside Park of Batumi is an epicenter of entertainments for the resort. It is like an eternal holiday there – music playing everywhere, cafes, bars, restaurants, clubs, sport centers, various attractions keep on working. A special place of interest of the Seaside Boulevard is the Dancing and Singing fountain with color illumination. Standing amongst blossoming magnolias it creates a unique romantic atmosphere. The fountain is designed to convey the sensation of water streams “dancing” to music. To enhance the impact it is lighted by multi-colored lamps. Another pride of the Seaside Park is a picturesque palm trees grove which served as a backdrop for many movies. Batumi Archaeological Museum is the oldest museum in Georgia which is already more than 100 years old. Batumi Archaeological Museum is a unique collection of items dated the Stone Age, Greek and Roman epochs. Besides, the Museum has a rich collection of ancient coins and the best samples of jewelry.